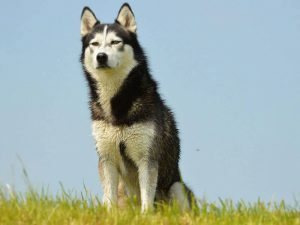 We are looking to rehome are Siberian husky as she just really is not getting on with our 4 year old son. It's a shame because she has the potential to be a lovely dog so I would advise she goes to a home without young children.. she is fine round other dogs and adults.. nearly trained to use her toilet pads and in the process of being crate trained. This is not an option we have taken easily and do regret it but our son has to come first.. any questions please get in touch.. 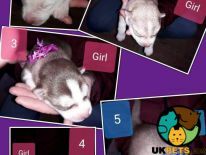 Female Husky Puppy Last One Left Blue Eyed. 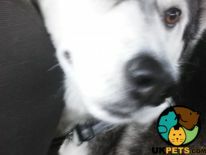 Akira is a beautiful Siberian husky, she’s fantastic with children and other dogs. It’s with great sadness that we are looking to re home her and is no fault of her own. She’s microchipped, up to date with vaccinations, flea and worming. She is booked in to be neutered in June so this will need to be carried out by her new owners. 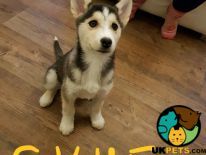 Akira is a very affectionate puppy, she’s still young so needs a home that can dedicate the time to work with her off the lead and have the patience and understanding needed to raise a bouncy husky pup! 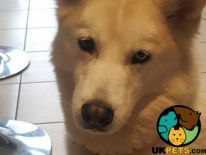 She will only be sold to a home that has adequate outside space for her, has the time to give her the attention she needs and preferably to someone who is familiar with the breed. I suggest a home with no cats as she hasn’t had any interaction with them in the past. My daughter is 5 and Akira will play very gently with her. Any child younger then 5 may not be suitable as she is a very bouncy playful girl. Am happy to answer any questions you may have.